As illustrated by a recent New York Times cover story, nursing homes throughout the country are rapidly adopting a “new” business model: attract lucrative short term patients paying through Medicare, and then throw them out once their Medicare coverage ends. People are often admitted to nursing homes to recuperate after a hospital stay, and typically have up to 100 days of rehabilitative services covered by Medicare, which pays a generous rate compared to other payment sources. If a person needs to stay in a nursing home for long term care after their rehabilitation days have run out, their Medicare coverage will end and they will need to switch to another payment source, such as Medi-Cal. Medi-Cal is California’s health insurance program for low-income elderly and disabled individuals, and it is the primary payer for approximately two-thirds of California nursing home residents on any given day. Medi-Cal payment rates for nursing homes, however, are significantly lower than Medicare rates. As a business practice, nursing home owners will often market their facilities as “short term stay” or “rehab centers” to attract lucrative Medicare patients. They will spread the fiction that they have limited or no “long term care beds” (i.e. Medi-Cal beds), and then aggressively discharge residents -- denying them care when they have nowhere else to turn -- once their Medicare-funded days are over. Some facilities will even include illegal notices in their admissions agreements requiring residents to acknowledge the limited availability of long term care beds in their facility. These practices are completely illegal, driven by profit at the expense of patient care. FACT 1: There is no such thing as a “short-term” or “rehab” skilled nursing facility. In order to be licensed as a nursing home in California, a facility must provide long term care. FACT 2: A facility cannot have a limited number of “Medi-Cal beds.” Any nursing home that is Medi-Cal certified must make every single bed in the facility available for patients paying through Medi-Cal. There is no such thing as a distinct part Medi-Cal wing. FACT 3: You do not have to leave a nursing facility just because your Medicare days are over! In fact, the facility must allow you to stay so long as you need skilled nursing care and those services are paid for. FACT 4: In Medi-Cal certified facilities, residents on Medicare have a right to transition to Medi-Cal if they are eligible. 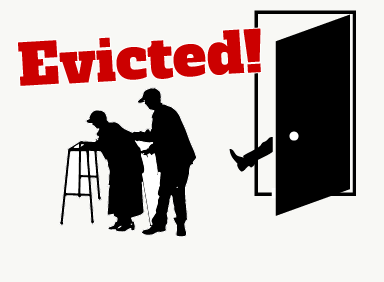 If you apply to Medi-Cal, you cannot be evicted for nonpayment while your application is pending. If you are in a shared room, you even have the right to remain in the same bed and not be moved to another room. It is illegal to discriminate against residents who are on Medi-Cal. So, if a nursing home is pressuring you to leave voluntarily when your Medicare days are up, simply don’t go. Tell them that no discharge can be performed without following all of the notice and other legal requirements and that changing payment source is not a sufficient legal reason for discharge. See CANHR’s fact sheet on Transfer and Discharge Rights. It’s also important to report any illegal discharge (or illegal notice in the admissions agreement that is not part of the California standard admissions agreement) to the Department of Public Health, the agency responsible for licensure and regulation of nursing homes. File a complaint with DPH Licensing and Certification. And please contact CANHR at (800) 474-1116 if you have any questions or need help. Don’t let the nursing homes endanger your loved one because they’ve decided that compassion is just not profitable.